Richard Du Moulin is the President of Intrepid Shipping LLC, private owner and operator of dry bulkers, crude and chemical tankers since 2003. From 1989 thru 2002 he was the Chairman-CEO of Marine Transport Lines. OMI Corp Exec VP-COO- 1974-1989. 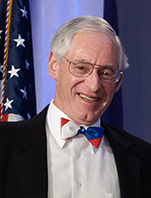 Richard served as Chairman of Intertanko (international trade organization for the tanker industry). Presently he is a director of Tidewater Inc. and Teekay Tankers and Vice-Chairman of the Seamens Church Institute. Richard is an International racing sailor and current Connecticut Maritime Assn Americas Cup champion!